Austin Musicians and Artists care! Thank you for all of the panels! NerdHQ & TNM ROCK! Good luck this year & have fun! Glory to God for the Blessing! Smile Ambassador Zachary Levi assembled a video crew to join him for his second medical mission with Operation Smile in Cauayan, Isabela, Philippines. Every 3 minutes, a child is born with a cleft lip or cleft palate. It takes as little as $240 and as few as 45 minutes to provide life-changing surgery and a bright, beautiful new smile to a waiting child. Your donation today means new smiles...new lives...new futures for children who have waited their entire lives for a life-changing surgery. With your help, we can be there for children like JC, no matter when they need us and no matter what it takes. Operation Smile is an international medical charity that has provided hundreds of thousands of free surgeries for children and young adults in developing countries who are born with cleft lip, cleft palate or other facial deformities. It is one of the oldest and largest volunteer-based organizations dedicated to improving the health and lives of children worldwide through access to surgical care. Since 1982, Operation Smile has developed expertise in mobilizing volunteer medical teams to conduct surgical missions in resource-poor environments while adhering to the highest standards of care and safety. Operation Smile helps to fill the gap in providing access to safe, well-timed surgeries by partnering with hospitals, governments and ministries of health, training local medical personnel, and donating much-needed supplies and equipment to surgical sites around the world. Founded and based in Virginia, U.S., Operation Smile has extended its global reach to more than 60 countries through its network of credentialed surgeons, pediatricians, doctors, nurses, and student volunteers. 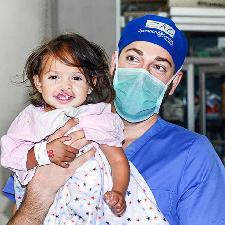 For more information, visit http://www.operationsmile.org.